by Daniel Willingham, Professor of Psychology at the University of Virginia, and author of The Reading Mind and Why Don’t Students Like School? This post, which originally appeared on Daniel Willingham’s Science and Education blog, is re-posted here with the permission of the author. E. D. Hirsch, Jr. celebrated his 90th birthday a few days ago. Instead, I’ll focus on three profound ideas that Hirsch developed and explicated, and that have had a substantial influence on my thinking. The seeds of Americans’ denigration of knowledge. Why would it be controversial to argue that children should share some common knowledge? The seeds of that idea lay in the Romantic response to the Enlightenment. Whereas Enlightenment thinkers esteemed knowledge of the world, the Romantics emphasized feeling, emotion, and especially esteemed the impulse of the individual. Whereas Enlightenment thinkers would emphasize social institutions as beneficial to human well-being and flourishing, Romantics depicted social institutions as problems, and portrayed humankind in its natural state as sanctified. 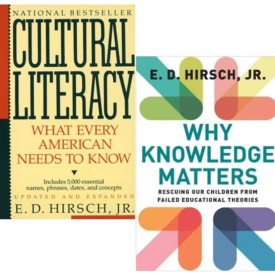 In The Schools We Need and Why We Don’t Have Them and in Why Knowledge Matters, Hirsch has argued that early educational theorists were influenced by Romantics to a degree few appreciate, and that we today are inheritors of their mostly flawed assumptions about human nature. These assumptions lead to a reverence for individuality and for nature, and a corresponding denigration of knowledge deemed important enough for all to know. Needless to say, a paragraph doesn’t begin to do justice to each of these ideas. If they are not familiar, I encourage you to explore them further–I’ve already made it easy by including the links to buy the books! Well said Dan! Don is an American treasure. He has provided essential, consistent, and coherent guidance in a time of remarkably distracting confusion of ideas in the vitally important topic of public education. Literacy is essential to the stability of our wonderfully diverse republic. It makes possible our ability to appreciate and embrace each other in a genuine sense of inclusiveness rather than destabilizing fear or intolerance. Don’s efforts to improve education for all children represent real contributions to the stability of our American society and prospects for equity for all. Very eloquently and thoroughly said. His books should be required reading in every elementary, middle, senior and college level schools for educators who care.